Cultivation information is the same as for the Black Walnut except that which is mentioned below. 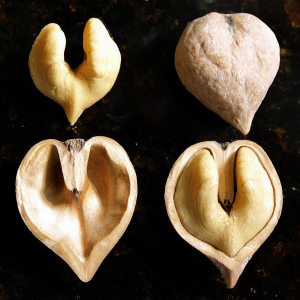 Heartnuts are a Japanese species of walnut. 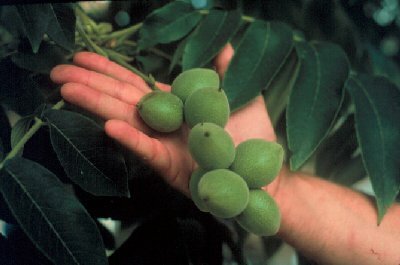 They are much closer to Black Walnuts than English Walnuts, but they maintain the superior flavor of the English Walnut. Heartnuts are also very easy to crack. May take 10 years to begin producing, though many produce much sooner. Heartnuts may produce one large crop every second or third year and smaller yields in between. Resistant to the walnut canker (from the fungus Sirococcus clavigignenti-juglandacearum). Closely related to the Butternut (Juglans cinerea) above. The Heartnut lacks the bitter aftertaste of Black and English/Persian Walnut nuts.